Exotic smells, Barker, musicians, snake charmers and thousands of lights in the evening. We are on the Djemaa el Fna, the famous market in Marrakesh, Morocco. Here we are tonight come by taxi, after we picked up our tour participants from the airport. 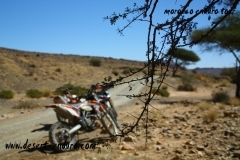 In the hotel were waiting the Enduro bikes, for our nice Morocco Enduro Tour . The next morning we left our cozy hotel and drive to the Atlas, the highest mountains in Africa. Now begins our Morocco Enduro Tour. We drive along narrow trails, through valleys and up to 3000 m high passes to the east, to Ouarzazate. Find Fantastic views and have fun! Our luggage is already ahead of us traveled in a support vehicle, so we have maximum enduro driving fun. The tour guides who are well versed, we travel in small groups. We stay overnight in hotels and enjoy the traditional, very tasty Moroccan food. Ouarzazate is also the starting point of our next day trip in the foothills of the Atlas, beautiful gravel roads, old Berber fortresses and the vast backdrop of the High Atlas, accompany us throughout the day. We leave Ouarzazate and continue to Dades Gorge with its famous Serpentine order on a difficult slope in the Todra Gorge to arrive. The next day we left the Atlas and go down into the desert plains, because we want in the big sandbox, the Sahara. Well the first true desert feeling arises. Here we can already “smell” the big rally’s because many of the tracks used by the famous Dakar Rally and the Atlas Rally. 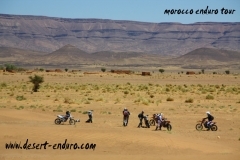 This stage continues into east, to Erg Chebbi, the northern dunes of Morocco, with its 300-meter high sand dunes. Here we stay for a day, relax by the pool, drink cafe and enjoy the live. And then it goes back to “play” in the dunes. In addition, the bikes need a bit of care. All sit together in the evening and the day ends with funny little stories. Because we have become used to drive the dunes just so beautiful, we give ourselves to the quiet day yesterday, today times the edge and really make a big sand round with the Enduro Bikes. There are several points to get out and go back on slopes or shorten. Now we’ve really licked Dakar blood and that is what on rally tracks on towards Tazzarine (we identify the name of but the Dakar is not it? ), We can go where we want and, yes, we finally have vacation and are not on the escape. And stay off in nowhere. Now it is always west to Ouarzazate, a station of the Dakar Rally and now has slowly civilization miss us again and all the desert. But we go back to the mountains on fantastic enduro routes we cross a mountain range which still stands in our way. 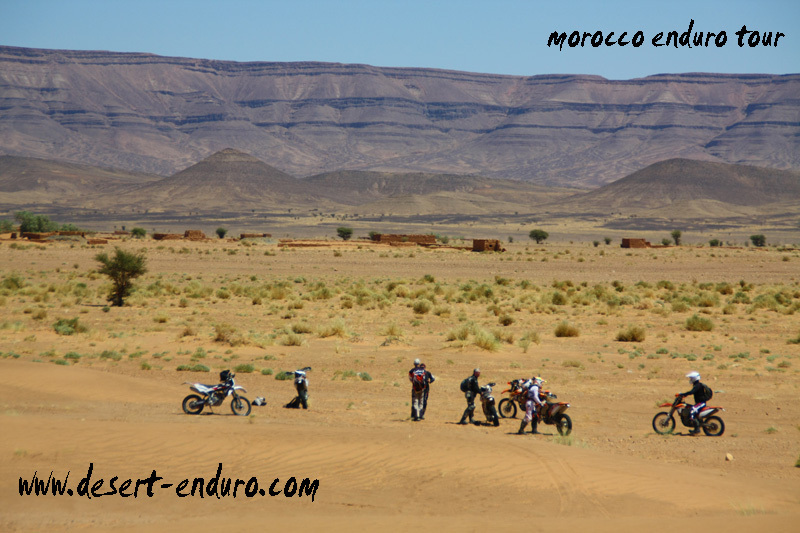 This shows again the special charm of Morocco, Enduro riding here is as varied as anywhere else desert, dunes, trails, singletrack mountain gorges and all of this is the enduro riders here on a tour. Through narrow passes, it goes to Marrakech. Where, unfortunately, the tour ends. Enter the hotel and showers, rest, eat well, maintain the bikes and prepare for transport. The last day visit after a nice breakfast Marrakech. In the market, there is everything you need and also what you do not need. Action is required and part of the culture here. Whom you’re getting into it, it makes a lot of fun and the people are very friendly. As elsewhere in Morocco. Now it is time to say goodbye and I can assure you on this tour you will remember for a long time back. Many come back.